The Quote button is absent in the post. Why and what to do? If you have checked "Reply-form is on a separate page" in Module Settings then the Quote button will disappear. If you want it back then disable this feature. I want announcements to be visible on all forum pages on top. Insert the necessary text in the forum template. You can format it as a table. There is such feature as pasting together of user’s post, i.e. if a user starts to flood (post messages one after another) then all his posts are merged together. This feature is adjusted for each group, for moderators and administrators it is disabled on default. I’ve searched the Control Panel and haven’t found where to adjust this feature. Control panel > Users > User groups > Edit group properties and permissions > Forum > Paste together repeated replies. Is it possible to remove the word Added in pasted together posts? An easier way is to edit the post. Do not edit a pasted together post if it is very long – it may exceed the permitted length. I want to rename an existing thread. Where can I do this? Go to the editing of the first post and change the name there. This option must at first be enabled for a group in group settings. File size must not exceed 0.5 Mb. If a file is an image it’s linear dimensions are not limited – use special services (e.g. http://imageshack.us or http://tinypic.com ) for the unification of image dimensions. I’d like to see how many times a file was downloaded from the forum. Is it possible? 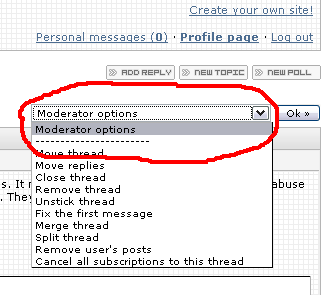 Select "Stick thread" in moderator options. How can I make important threads colored? and change their color for the necessary one. If there are no such classes in styles then add them. Sometimes this class is written together with the class a.threadLink:link – in this case separate them. Is it possible to remove the inscription that the message has been edited? The minimal time for editing posts in default settings is 1 day. I’d like to change it for 5 minutes. Is it possible? No, 1 day is the minimum. How to remove all user’s posts? All threads, created by the selected user, will be removed, but user's replies in other users' threads will remain. All user's replies in all threads will be removed. The first post in all user's threads and threads themselves will remain (as the first post is not a reply). First of all select a user by clicking on Select user. You’ll see a pop-up window (if pop-up windows are not blocked by your browser) – enter (or better copy and paste) a username in the field and click ОК. Click on the found username and it will appear in the form for removal. Choose the necessary method and click ОК. Note: A username will be visible on the forum main page as the last person who replied till someone else replies to this thread. I think this is going to be more helpful..